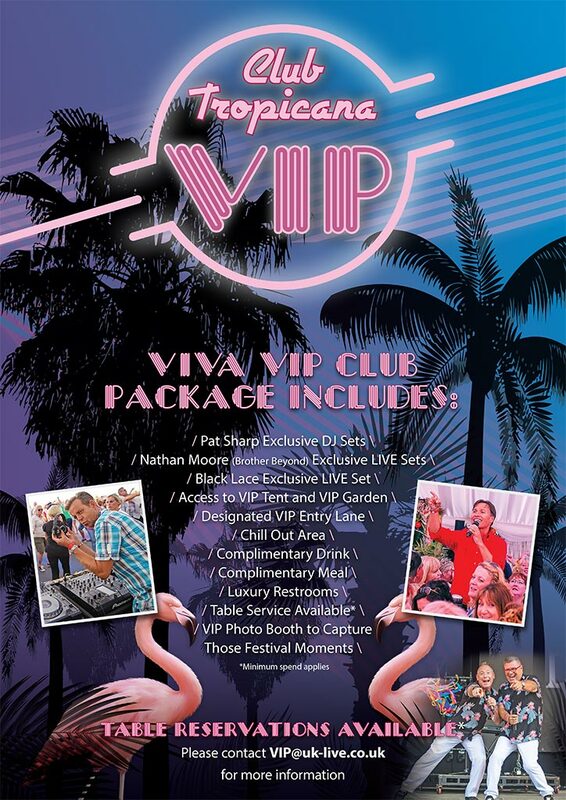 2019 will see our ever popular and totally cool, funky 80s themed CLUB TROPICANA VIP enclosure. As well as entry to the event, VIP tickets include fast track entry, luxury loos, meal and welcome drink. PLUS exclusive DJ sets from Pat Sharp and live sets from Nathan Moore (Brother Beyond) and Black Lace. Sit back and relax in this exclusive area with comfy seating and chairs and a full bar serving quality brands and 80’s cocktails, plus of course the all-important VIP luxury loos – essential at any festival! Fancy dress is recommended, but not compulsory! Alternatively, you can call Gigantic customer services between 9:00am and 5:30pm Monday to Friday on 0115 807 7900. Please note that VIP does not always guarantee the best view of the stage.